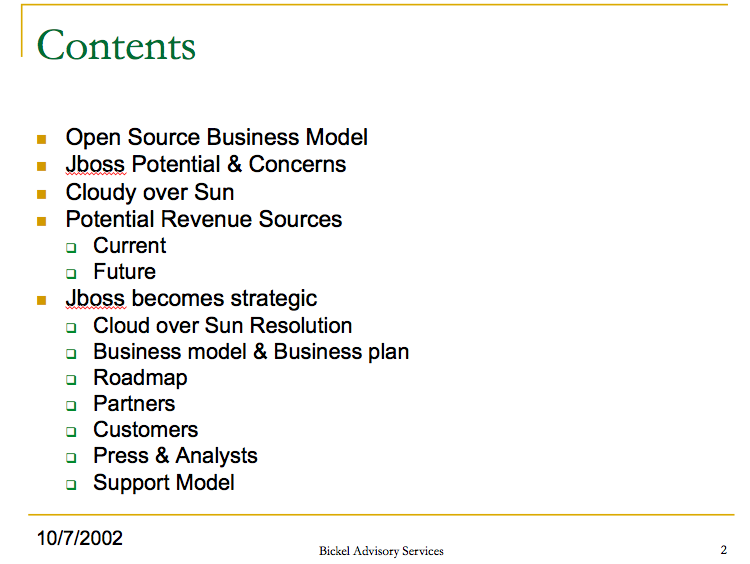 This is Part 2 of my personal recollections of JBoss. Please read Part 1 first, unless you are one of those people who eat desert first. In Part 1, I had left that first meeting in New York being very impressed with JBoss and Marc. We agreed to meet on October 7, 2002 in Atlanta. We actually met in my hotel room with Marc, Ben and Marc's father, Daniel. Daniel was an elegant man. I know that may sound strange - but between his French accent, his strong experience of the world (He had been an executive for P&G in Europe), his sharp questions and easy manner - I really liked him. Marc credits him with a lot of the inspiration and confidence to do JBoss. You can see a dedication and picture of Marc and Daniel on the right in Marc's "White" paper. 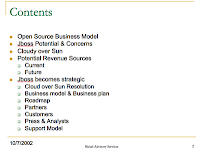 We had a number of discussions between our initial meeting and reviewing this set of slides that I have sprinkled on the side of the page here. In this meeting we kind of laid out the basic roadmap for the company for the next several years. Simple Plan - You can see there is a lot of pretty simple stuff in here. Take our time and work our way up the ladder. 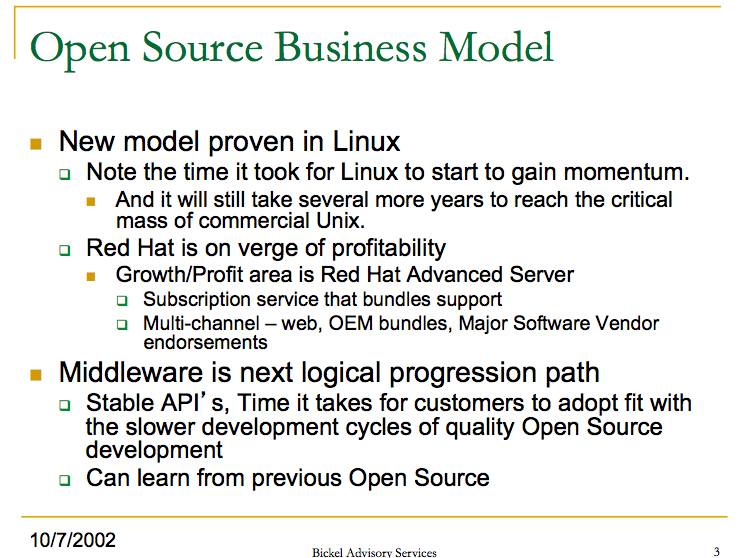 Learn from Linux and Red Hat (funny Red Hat was just turning profitable back then). Partners. Press. Move from Developers to Deployment. Move to a Production Support model where there were multiple points of value. 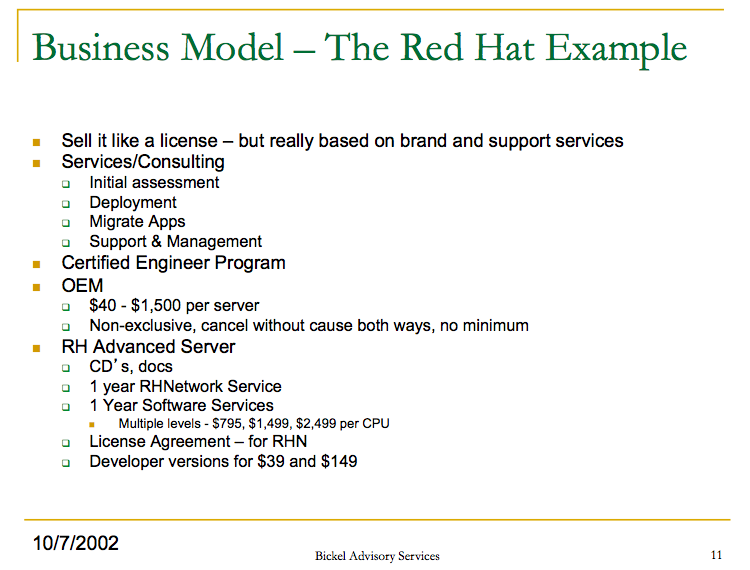 It took us a while to get to this real vision - about 2 years before JBoss Operations Network debuted as an example. 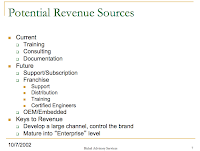 Revenue - was from Training, Documentation Sales and Consulting/Support. I think 2002 ended around $1M. Ben and Marc had come up with a clever way to sell support in those early days - basically sell a minimum of 50 hours of phone support. If a customer used only a couple of hours, then there was great profitability in that - and that was the normal pattern. This allowed a price tag of like $5K, which was high enough to support an inside sales model. During 2003 Ben hired Mark Andres as an inside sales rep - he was just out of school and turned out to be a great part of the team. 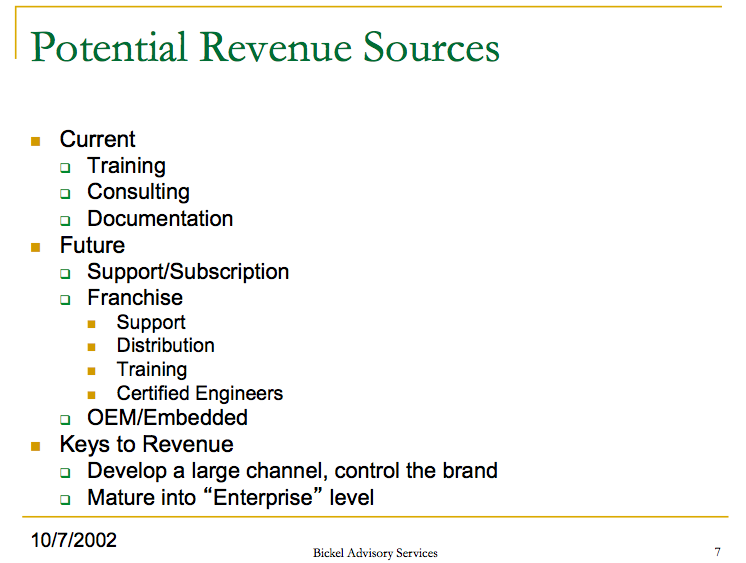 We ended 2003 with about $3M of revenue. 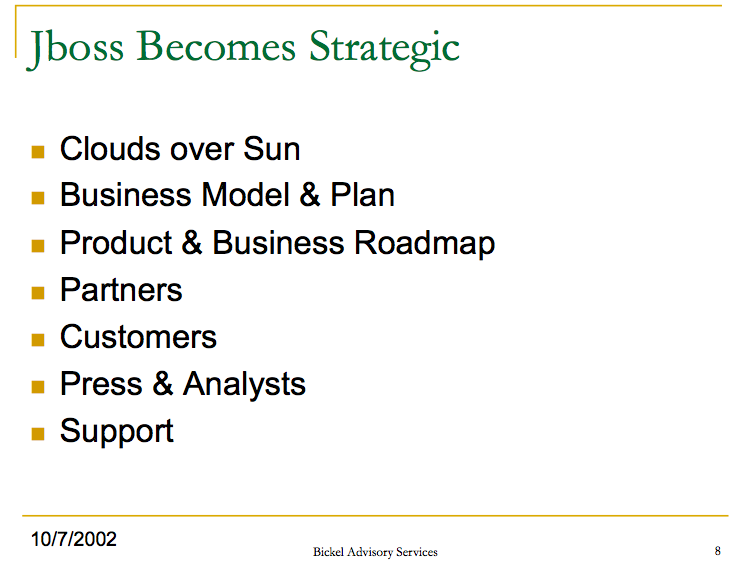 PR - During the end of 2002 and into 2003, JBoss hired a PR firm to start giving it more visibility. The company was a hot topic. Marc was very charismatic and gave great one liners that the press loved to pick up on. We picked fights with the big guys and everyone loved the David vs. Goliath story. In later years we would time a quarterly press release that went to every financial analyst who covered BEA the day before BEA announced their earnings. 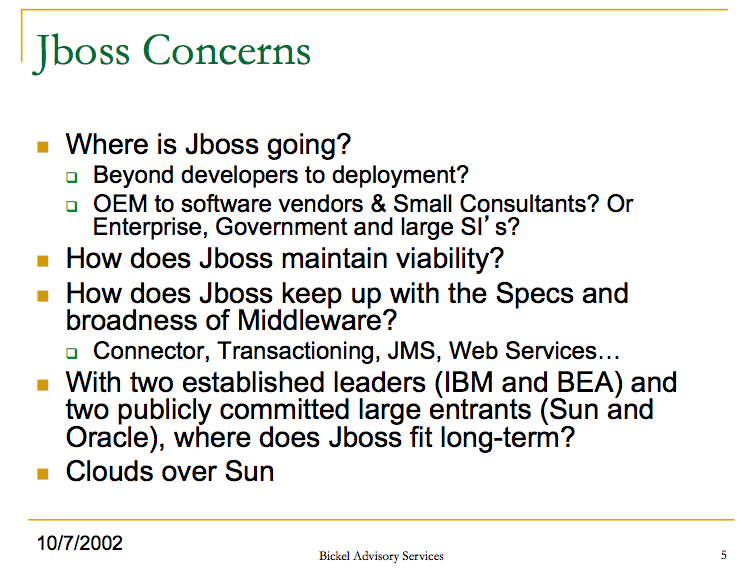 So when Alfred held his quarterly earnings call someone would always ask him about JBoss and he would blow up. Very funny! 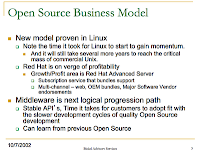 Tech Differentiation - While the business side was trying to figure out the direction, the open source project continued to execute. The key feature in JBoss is not talked about that much. But basically a developer did not need to recompile their whole project every time they made a change like they did in WebLogic and WebSphere. This meant the 100 changes a developer made in a day were immediately executed rather than wait 2-5 minutes for a build in another system. 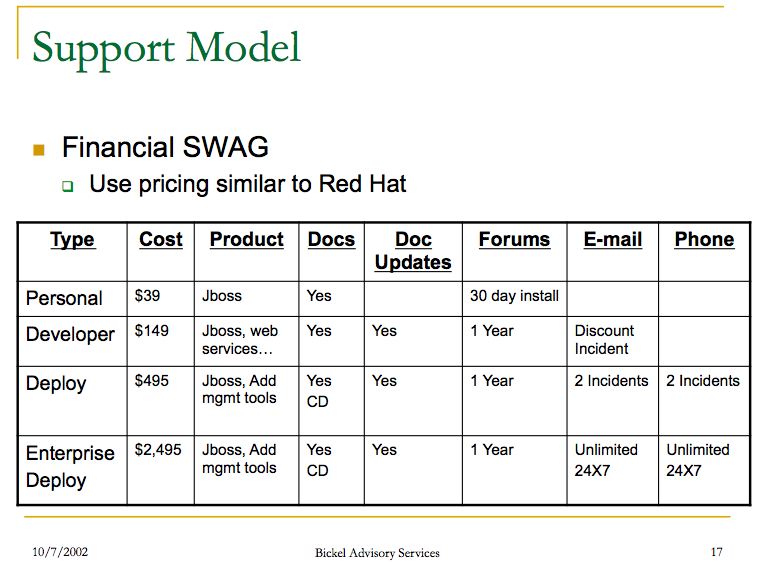 Many, many WebLogic and WebSphere shops were using JBoss on the developer's desktops. 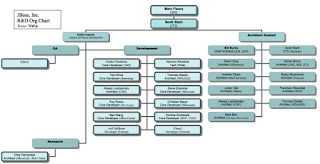 Economic Interest Units - In my next post I am going to talk about the technical team. At this time, there were only about 6 real employees at the company. But the network extended beyond this. Marc had been creative in terms of trying to farm out some consulting and training work to a lot of them to keep them interested in working on the project. In 2003 Marc did one of the most amazing things I have ever witnessed - he simply gave away "shares" in his company to probably 30+ people who had made contributions in some way to JBoss. This act of generosity and recognition that there are a lot of people that deserve credit in the success of a company was impressive and earned my deep respect. Since it was still an LLC, he came up with the idea of Economic Interest Units. 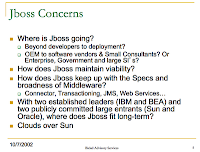 These later became shares when JBoss became a Corporation. 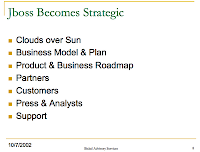 Jim Green - Jim Green was the CEO/Founder of Active Software, which was acquired by webMethods. He was the first strategic user of JBoss that saw the potential and became an important advisor to Marc and the company. 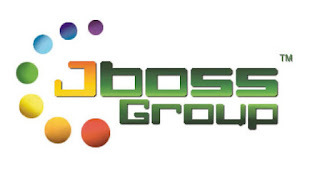 Their endorsement of JBoss was a critical step in making JBoss "acceptable" for beyond development. Ukiah Retreat - In the summer of 2003, Marc assembled a group that included Sacha Labourey, Jim Green, Larry Augustine and myself along with our host, Larry Rosen. Larry has a beautiful house outside of San Francisco in Ukiah. We met for a day to discuss the future of JBoss. Many of the topics brought up in the slides above were discussed. The Sun J2EE friction was discussed and I think we made the decision to finally bite the bullet and pay Sun their extortion fee for saying we did J2EE. It was also at that retreat that I started thinking about JBoss on a more full time basis, which happened in September of 2003. Keep it coming Bob - I'm enjoying the read. The compensation plan... in retrospect I am not so sure it was such a good idea. If you remember it was also the point where some people picked up their marbles and decided to go play somewhere else. With 20/20 hindsight the reason was obvious, most people over estimate their contribution. What was harder to swallow for some folks was that the distribution was actually decided by a committee, not just me and it was as close to 'fair' as our little group could come up with. My dad did help a lot in crafting it as it was a little tricky because, as you point out we were an LLC and not a C corp. Ironically the big public spat the dividing faction raised was the first big 'controversy' and it brought us to the attention of investors as well. In many ways, these unfortunate incidents pushed us to accelerate. Which meant 1/investment 2/ PR. The PR paid off handsomely because of the reasons you mention (it was a fun story in a rather dull industry). I don't know if you are going to talk more about the certification but that was really something you pushed for and at first was a bit of stretch. 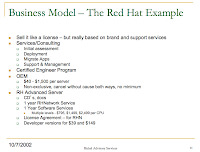 So I remember you pushing, and I don't remember the number exactly but it was a significant number and furthermore it was money that came out of my personal pocket since at the time JBoss was an LLC. By the time we were leading the pack in terms of downloads and were everywhere, they had no choice but to GET US TO certify us or fear splinting the community and watering down the J2EE brand, by that point it was just a question of time and resources. In retrospect you were bang on on that call. On the comp plan and dis-satisfied people. I am going to cover that a bit in Part 3. Pies are only 360 degrees and always tough to split. No matter how big you grow that pie. Pretty much anything we did publicly that even touched the idea of business + open source + $$$ sparked massive viciousness. One of the things that annoyed me the most was that Spring Source pretty much followed in our business footsteps and they never received the negative backlash we did for doing the exact same sort of things. Kinda makes me feel we blazed a path for others to follow.